Lake Titicaca is a geological wonder located in the Andes between the Peruvian and Bolivian borders. Perched at an incredible height oh 12,507 ft, Lake Titicaca is the world’s highest navigable lake. Alongside being the world’s highest navigable lake, it is also the largest lake in South America by volume of water and surface area. The lake was formed following a number of huge earthquakes the fractured the Andes Mountains resulting in a split of the range in two. This split then formed a hollow which eventually became filled with water from the surrounding melting glaciers. This created a series of bodies of water which eventually joined together to form the magnificent Lake Titicaca. Lake Titicaca was home to many ancient civilisations in the past. The Puraka people settled here in order to enjoy the riches of the fertile soil around 200 BC. Approximately 1,000 years later the Tiwuanaku culture began to grow and spread through the Altipano and into Bolivia. Numerous civilisations occupied Lake Titicaca and the surrounding areas throughout the years. These include the Aymaras, the Collas and finally, the Incas, who united many cultures. The current inhabitants of the area are the Uros people, who have held the land for hundreds of years. Since the division of Lake Titicaca between Bolivia and Peru, there has been constant dispute between Peruvian and Bolivians in regards to who got the more beautiful side. The locals refer to the more beautiful side as the “Titi” and the less beautiful as the “Caca”. 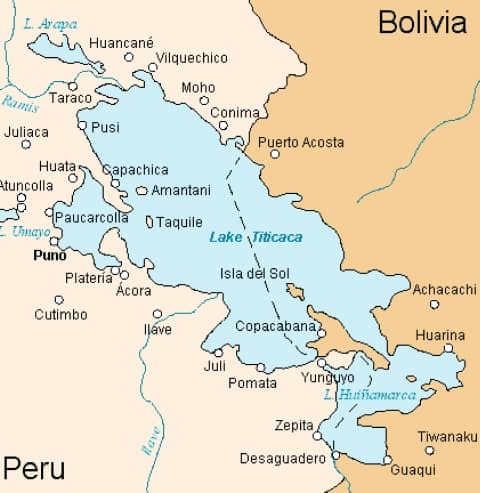 The main towns on each side of the lake are Puno (Peru) and Copacabana (Bolivia). Generally, Copacabana is considered the more scenic of the two and usually appeals to more tourists than Puno, its neighbour across the lake. 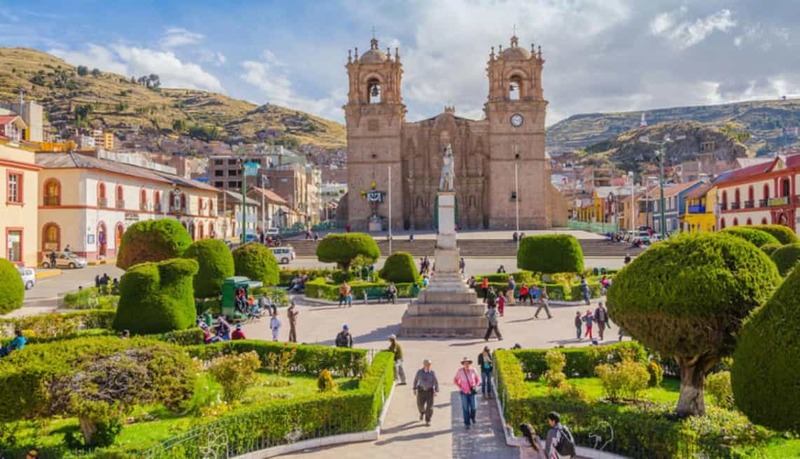 This doesn’t take away from the wide range of attractions and stunning views on offer in the city of Puno. Apart from being home of the peruvian side of the lake and its islands, Puno also has many other attractions, some of them being the “miradores” (viewpoints) that can be found around the city, offering magnificent views of the lake. The most impressive of these viewpoints is “Mirador El Condor” which boasts a giant steel statue of a condor which watches over the lake and the city itself. Further north, another animal themed mirador, Puma Uta can be found. Puma Uta is a statue of a roaring Puma which also stands guard, keeping watch over the city and the lake. There are also a number of archaeological sites to visit in Puno, One such site is the pre-Inca Cylindrical tombs of Sullustani. This is where the noble people of the Aymara Qulla people were deposited in burial towers called “Chullupa”. Eventually these tombs were raided by conquerors such as the Incas and Spanish. Copacabana is a town dedicated largely towards tourism. It offers attractions for both travelers who wish to party and those who wish to relax and overlook the beautiful lake. Many Bolivians can be found here on pilgrimage to the Copacabana Estaciones de la Cruz Shrines. Copacabana is also an incredible location for hiking with an abundance of beautiful trails and exciting treks. One of the most popular attractions here is the fantastic Basilica of our Lady of Copacabana, a cathedral that was built in the moorish style. It is one of the most impressive and interesting cathedrals in all of Bolivia. 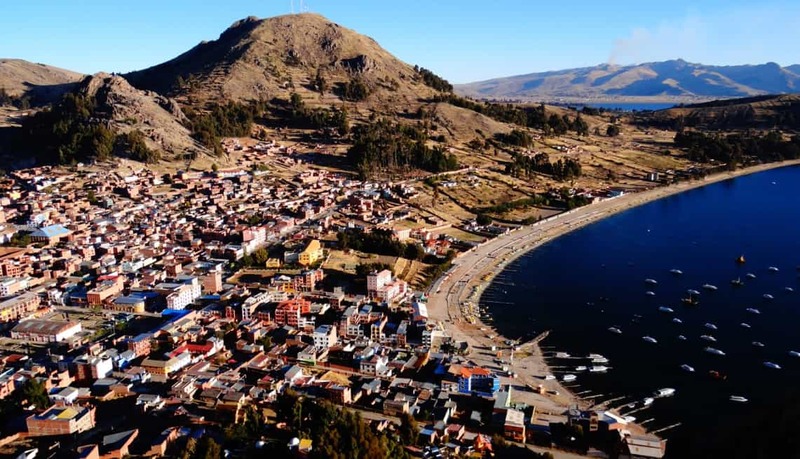 Copacabana also acts as a gateway to the sacred Inca island “Isla del Sol” or “Island of the Sun”. This island is home to a number of ancient sites which hold many artefacts and ruins. Traditional rituals are still performed on the island today where a combination of catholicism and the native Inca religion thrives. The Isla del Sol is of great importance in Peruvian mythology as it was believed to have been the birthplace of the sun itself and home to the original Inca rulers.